In my previous post, I described how my effort to blog consistently in 2016 did not work out. I am happy to report, however, that not all of my writing efforts were a fail. At the end of 2015 I set a goal for 2016 to write 1,000 words per day every day for the entire year, 365 days. I tracked my process, and provided updates on a monthly basis. My July update was the last official entry on the status of the project. By July I had already written over 320,000 words. 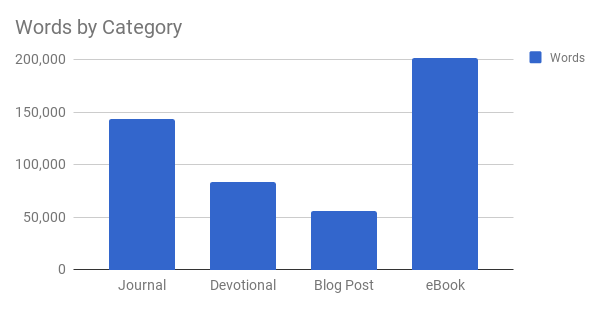 By the end of the year I wrote 483,790 words in primarily four categories: daily journal, blog posts, Christian essays (I wanted to write a devotional), and ebooks. Initially I had hoped to write 250 words per day in each of the categories, but somewhere along the way I decided to focus on writing ebook content. I also discovered that my daily journal entries gradually increased in length. As a result, I exceed my writing goal. This chart shows my journey to 365,000 words and beyond. For me, while writing 1,000 words or more per day was exciting, I found that the experience burned me out a bit for writing. I spent 2017 working on editing and publishing tasks, but wrote very little. In future posts I will be sharing the tangible result of my Writing 365 project. If you do not have writing goals, I encourage you to start with a small overall goal, like 10,000 words, or a daily goal of 250 words.